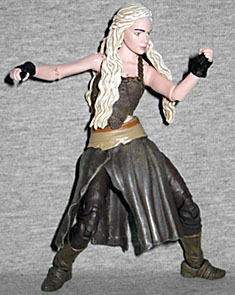 This past February, days before Toy Fair, Barnes & Noble began shelving a line of Game of Thrones action figures. There was no fanfare, (almost) no announcement they were coming... they just appeared, surprising everyone. "I am Daenerys Stormborn of House Targaryen, of the blood of Old Valyeria. I am the dragon's daughter, and I swear to you that those who would harm you will die screaming." Daenerys Targaryen began, in the story, like most of the women of Westeros: as an object, as some man's property to be traded for goods or services (in this case, her brother Viserys, who swapped her for an army). She was abused, infantilized and ignored for most of her life, until she took it upon herself to turn things around (quite literally: in the words of Barney Stinson, she "Turned. It. Around"). She made people see her as a human, starting with her husband and working out from there. Funko is no stranger to making toys, but this is their first crack at realistic action figures, so nobody knew what to expect. The likeness is quite good from most angles, though not as uncanny as some of the ToyBiz Lord of the Rings toys. Regardless, this is recognizably the tiny plastic face of Emilia Clarke, even without the hair and costume giving cues. There's another Daenerys coming in Series 2, but that one's wearing her fancy blue dress from the later seasons; this is Dany in her Dothraki clothes, when she first came into her own as Khaleesi. Gone are the loose, ephemeral dresses meant to present her sexually, replaced by a roughly woven top, a split suede skirt worn over leather breeches (perfectly sensible for a culture that so highly values horses) and simple, sturdy boots. 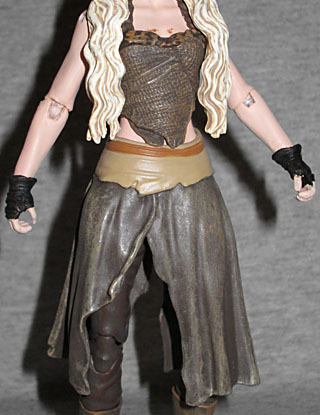 She's painted all in browns, Why did I go for this Dany instead of waiting for the Series 2 version? Eh, what can I say? You grow up in the '90s, and that combination of grunge and nostalgia-fueled hippy-ism gets pretty deeply ingrained into your consciousness. Rowr! 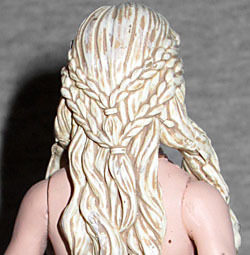 The hair that doesn't fall over her shoulders is pulled into some ornate braids. It's painted a pale yellow, then given a brown wash to fill in the crevasses. Her eyes are green (matching the show, not the books), and her skin is pale. There's a little bit of a paint smear on the chest of this figure, but it just looks like some desert schmutz. Overall, the toy's sculpt is good - again, on par with the LotR and Hobbit toys. Why do we keep comparing her to those? Because this line is in the 6" scale, not the 7" most TV and movie toys use nowadays. The articulation is much better than ToyBiz's stuff, however. She has a balljointed head, swivel/hinge shoulders and elbows, swivel wrists, a balljointed torso (hidden by her shirt), swivel/hinge hips, swivel thighs, double-hinged knees, and hinged/rocker ankles. The joints are molded from clear plastic, which is bad news: that stuff is always more brittle than opaque plastic, and some of our readers who managed to find these figures before I did have reported breakage. So far everything on my figure is fine, but it's something you need to be aware of - definitely open your toys and check them before the receipts expire. 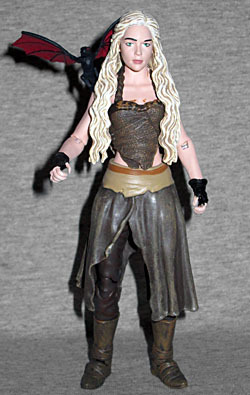 When I took Daenerys out of the packaging, I thought a molding error had left a hole in her shoulder - nope, that's intentional! 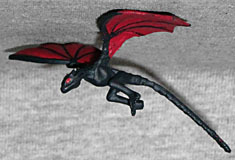 She comes with an unarticulated baby dragon (to be entirely accurate, an unarticulated baby "Drogon" - that's the black one's name) that can plug into her shoulder. His red wings are spread and his tail falls down her back. He's detailed nicely, but come on: only one dragon? Where are Viserion and Rhaegal? Dany herself isn't even 5⅜" tall - they couldn't spare the plastic for the other two dragons? Maybe they're planning to release one dragon with each version of her, but then you'll never get three that are the same size. Boo! Funko's Game of Thrones Legacy Collection was a huge surprise - no one was expecting them to show up when they did, and no one was expecting them to be as good as they are. Yes, there are some flaws, but the last company to come out of the gate this strong was Gentle Giant, when they briefly made Hellboy toys. These retail for $20, which seems high for what you're getting, but even Marvel and DC toys are getting there now. Funko has plans for other Legacy Collection lines, like Firefly and Magic the Gathering, and if the quality stays this high, we're in for some good toys.